Villanova University’s 174th year was a good one. For the first time, they’re ranked nationally on US News and World Report’s list of Best Colleges and Universities, coming in at #50. They’ve exceeded their capital campaign goals with a year-and-a-half left in the initiative, and they’re expanding their presence on Lancaster Avenue, adding a performing arts center and parking garage, among other things. One of their well-known alums, Matt Szczur, helped the Cubs win their first World Series since the Edwardian era, and, of course, there was that little thing about the second NCAA basketball championship in the school’s history. However, it looks like their 175th year is shaping up to be even better. They’re starting the year ranked first in college hoops, their academics are still going strong…. How cool is that?!? For most of us, the only thing our beloved alma mater has ever asked us to do is send a check. Our favorite boys get to be a part of their alma mater’s 175th anniversary. Villanova reached out to us earlier in 2016 to gauge our interest. (We think that Pope Francis put in a good word for us after #YOPO. That had to be it.) We were definitely interested, but there were some questions yet to be answered. Jimmy and Brian began putting their heads together for some recipe ideas, and Ryan and Hank crunched some numbers. Thankfully, all of the moving parts came together and we jumped on board. Now, we bring to you Demisemiseptcentennial Ale, because of course that’s its name. It’s been fun trying to fit that on a bottle. Yes, it’s going to be bottled! It’s our first new bottling run of 2017, and we couldn’t be more proud. You’ll be able to find it at your favorite bottle shop later this month, along with seven of our other fine creations. It’s a great addition to an already-robust bottle lineup. With a name like “Demisemiseptcentennial Ale,” you can probably guess what variety of hops we used. A name like that is just begging for a hefty dose of centennial hops. Combine them with some German Pilsner malts and our House Ale yeast, and you’ve got a clean and easy-drinking pale ale for the ages. At 4.5% ABV, this brew is eminently crushable, perfect for quaffing as you cheer the Wildcats to a repeat of last year’s huge basketball season. 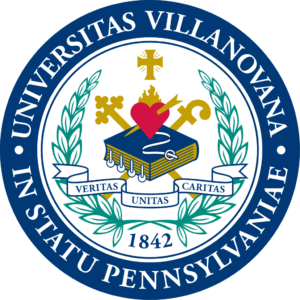 We’re currently in the process of signing on all of the major Villanova bars up on the Main Line, since this is something that’s going to make their clientele go slightly insane. 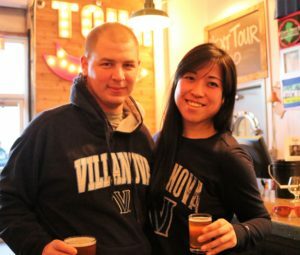 We plan on distributing this one much like we do all of our other brews, so, no matter where you are in the area, you’ll be able to have a little piece of Villanova at your corner bar. The response from the bars in the area has been outstanding. The vast majority of them have signed on sight-unseen, not even tasting the brew, only our reputation and the concept for the brew to go on. Mop Man has been pounding the pavement up on the Main Line and in the surrounding areas. The official release of this brew in New Jersey will be Friday, January 27th in the Tasting Room and at the Andy Talley Bone Marrow Foundation’s Second Annual Szcz the Day Dinner. 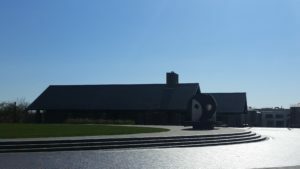 Held at the Cape May Convention Center, the evening honors Villanova alum, Cape May’s own Matt Szczur, and CMBC has signed on to be the official beer sponsor. Matt donated bone marrow several years ago, saving the life of an adorable girl in the Ukraine named Anastasia. Since then Matt and his wife Natalie give much of their time in the offseason to this worthy cause. However, we’ll have a sneak peek for our dedicated fans on Wednesday, January 25th. To kick off the dinner, we’ll have a pint night, with $1 off each pint being donated to the Andy Talley Foundation. There’ll be a special one-off, and Matt will be there to help us raise some cash. It’s our first charitable cause of the new year, and you’re not going to want to miss it. There’s a lot more information to come on Demisemiseptcentennial Ale. This is an exciting time for us — and the Philly region in general: reigning National Champions, Matt Szczur winning the World Series, people get to learn the word “demisemiseptcentennial”. We’re in for a fun ride, and we’re thankful to bring you along. 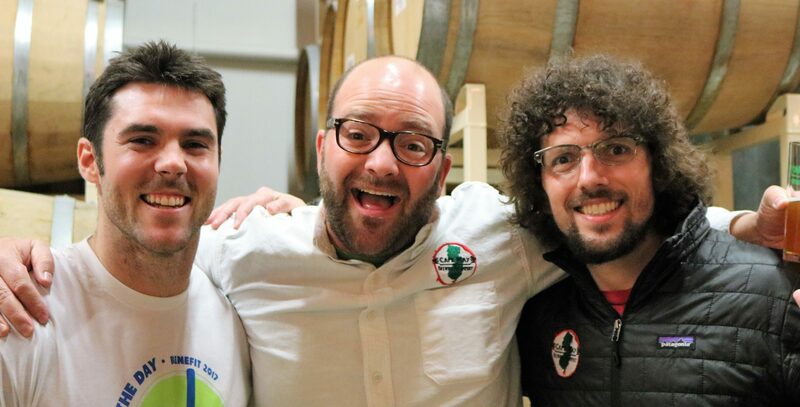 Gary Monterosso and the crew from What’s on Tap were on hand at our Pint Night in January for the release of Demisemiseptcentennial Pale Ale — our brew in honor of Villanova’s 175th anniversary. They got together with Ryan and Cubs outfielder, ‘Nova grad, and Cape May native Matt Szczur. “Really, really good people,” Gary said, in reference to our commitment to being a good neighbor. Check out the video below to see what else they had to say, including his interview with Ryan and Matt. 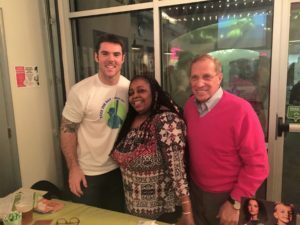 You can hear Matt talk a little more about his involvement with the Andy Talley Foundation, as well as how he saved the life of a young girl in the Ukraine. So… what are you up to on Sunday? Maybe headed to watch some sort of sporting event? It’s the most-watched television event of the year — and Villanova’s not even playing! So, whether you’re cheering Atlanta or New England, thanks to Head Chef J.P. Thomas, we’ve got your game day foodies covered — and the Demisemi in stock now to handle it all. No party is complete without a great dip, and J.P. came up with a great one! Cheesy, spicy, and Demisemi-y, this dip is the perfect complement to any chip. Add beer to pan, reduce down by 2/3rds. Reduce flame/heat to low. Add butter and hot sauce. Simmer for ten minutes. In an oven-safe dish layer cream cheese, then a layer of chicken, hot sauce, then blue cheese, Repeat. Finish top layer with Colby Jack cheese. This hearty beer soup/sauce hybrid is just garlicky enough to keep your guests interested, just creamy enough to keep them satisfied, and just beery enough to let them know who you’ll be rooting for come March. Sautée vegetables in butter or oil over medium high heat. Once tender (5 mins) reduce heat to low, add mustard and flour. Mix well. Add beer, stock, and half and half. Bring to a simmer for 15 minutes. Add cheese in handfuls, whisking until melted and smooth. What game day is complete without chili? It’s perfect for football gatherings — spicy, filling, and a little goes a long way. This bad boy’s easy to scale up if you’ve got a huge party planned, but big enough on its own that you could be eating this for days to come. Add garlic and onion. Sautée until soft. Add beer and reduce by half. Add tomatoes, beans, and seasonings. Simmer on low heat for 1 hour, stirring periodically. SNJ Today has been giving us some love lately, with Ryan as a guest on What’s on Tap just a few weeks ago and now being on hand for our Pint Night supporting the Andy Talley Bone Marrow Foundation last week. They’re definitely loving on our “uniquely-named” brew, and we don’t blame them! “The Andy Talley Bone Marrow Foundation speaks to our Core Values, so we want to ‘Be a Good Neighbor’ and do what we can to support a great cause,” Ryan said. They enjoyed seeing Matt Szczur being a part of it, too. So did we! It was great having him down to the brewery multiple times over the past few weeks — Matt’s a great guy with a huge heart. Having him part of this has been an unbelievable treat. In addition, Gary Montorosso recorded a new episode of What’s on Tap that night, with Ryan and Matt as guests. Once we know when it’s going to be aired, we’ll keep you updated. 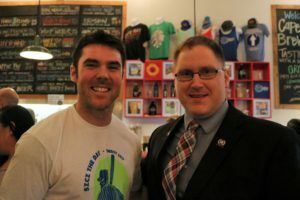 Matt Szczur — Cubs outfielder, Villanova alumnus, and Cape May native — sums up his feelings on our recent Pint Night, raising money, awareness, and donors for his favorite charity, the Andy Talley Bone Marrow Foundation. Between our Pint Night and his Second Annual Szcz the Day Dinner on Friday, he’s hoping to exceed last year’s total of $80,000 raised for the organization and 75 potential donors. 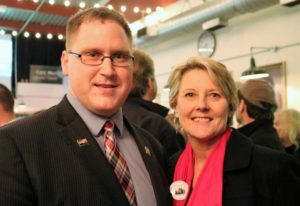 We raised $1,068 toward that goal and signed up 25 potential bone marrow donors, including Assemblyman Bob Andrzejczak. And the beer in everyone’s glass that night was Demisemiseptcentennial Ale. Matt helped us create a one-off for the evening — Szcz the One-Off-Wednesday, Demisemi conditioned with orange, pineapple, and coconut — and the keg was kicked well before the conclusion of the evening. 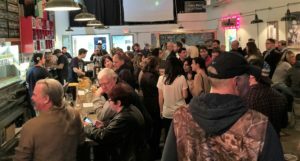 “Demisemi is selling out like crazy,” reported Brewtique Manager Emily Bowman. As we investigated the Brewtique close to the end of the evening, Beertender Jake Hauser couldn’t keep the beer-to-go fridge stocked quickly enough: he came out of the back room with four cases on a hand truck, and they were gone before he could even get to the fridge. “It’s unbelievable,” Matt said, regarding Demisemi. Kym and Brian of Conshohocken played hookey from work on Wednesday to come down for the Pint Night. They’d been meaning to make a trip down to the brewery for a while, and when she saw the Pint Night on Facebook, Kym’s friends asked her if she was planning to go. “Of course, I’m going!” she said, enthusiastically. 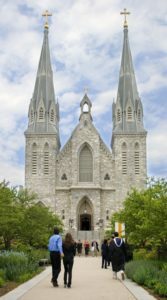 Lovers of “all things Villanova,” Kym graduated from the University in 2010. They’ve been to nine Wildcats basketball games this season and were heartbroken at the ‘Cats loss to Marquette the night before. Nonetheless, they were loving on Demisemi. Kym had been a fan of the brewery for a while, “but I love you a thousand times more, now,” she said. 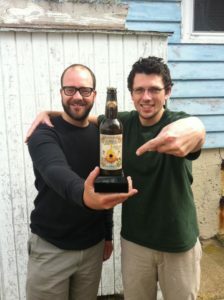 2009 graduate and Ocean City native Andrew Clare was equally as enthusiastic about the brew. “It’s a nice tribute to Villanova,” he said. “The floral aroma makes it incredibly drinkable, with just enough hops to be inviting and not off-putting. “I’m excited to get a growler and enjoy it at home!” he said. Regardless of the success of Demisemi, the night was all about the Andy Talley Bone Marrow Foundation. It will prove to be a big weekend for Matt and for the Foundation. We raised over a thousand dollars for bone marrow awareness and research, but the dinner on Friday night should see a much greater return. Ryan and Hank were both thrilled to see our night such a success. Hopefully, one of the 25 potential donors there that night will be a match for someone, but the odds are admittedly against us. According to the Be the Match website, the odds are about 1 in 430 that a donor will be matched with someone in need. We hope it was someone at the Tasting Room Wednesday night. 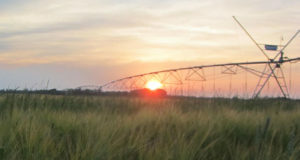 For more information on the Andy Talley Foundation, see their website. If you’re interested in donating bone marrow to someone in need, see the Be the Match website. 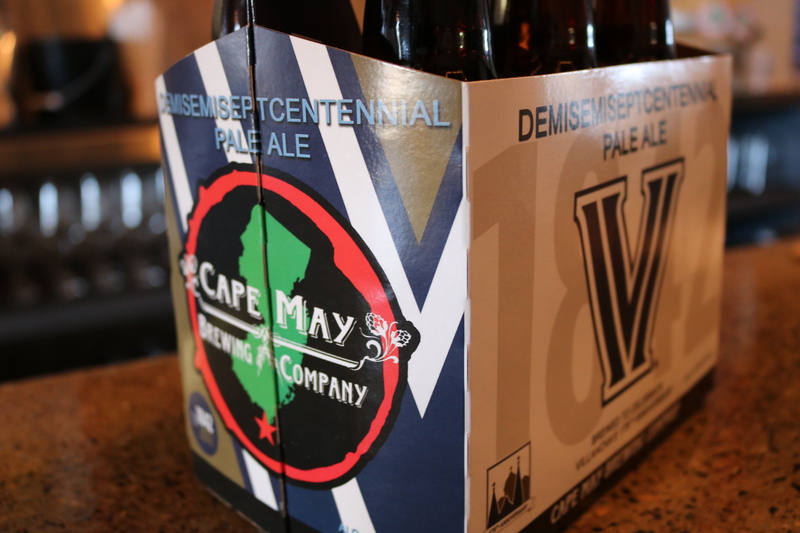 We begin distributing Demisemiseptcentennial Ale to our New Jersey accounts on Monday. Be sure to stop in your favorite restaurant, bar, or bottle shop and pick up some Demisemi. 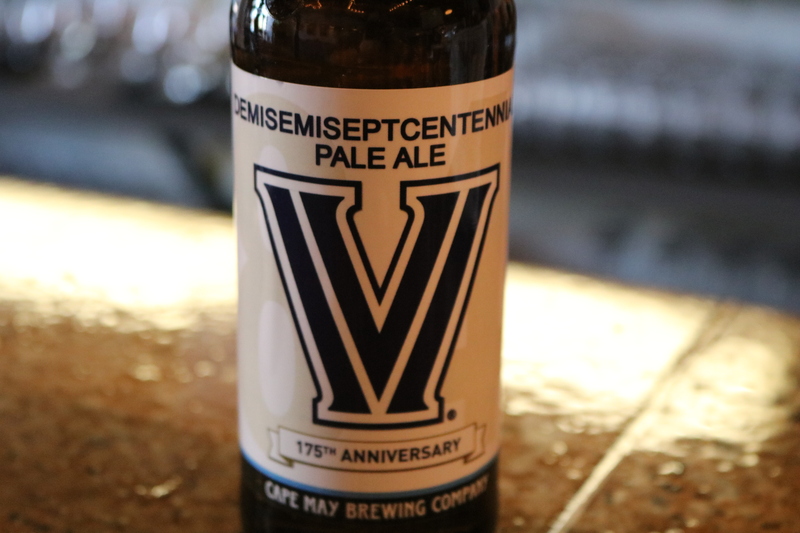 You’ve heard about everything that’s gone into the creation of Villanova’s 175th anniversary beer, Demisemiseptcentennial Ale… but what does it taste like? What do you guys think of Demisemi? Let us know in the comments! We’re bottling Demisemi as fast as we can, trying to get it out to you even faster. But if you just can’t wait, swing down to the brewery — it’s available beginning Wednesday. We have bottles and growler fills just waiting for you. In the meantime — until you can get your hands on a bottle — have this moment of zen. Holy press, Batman! 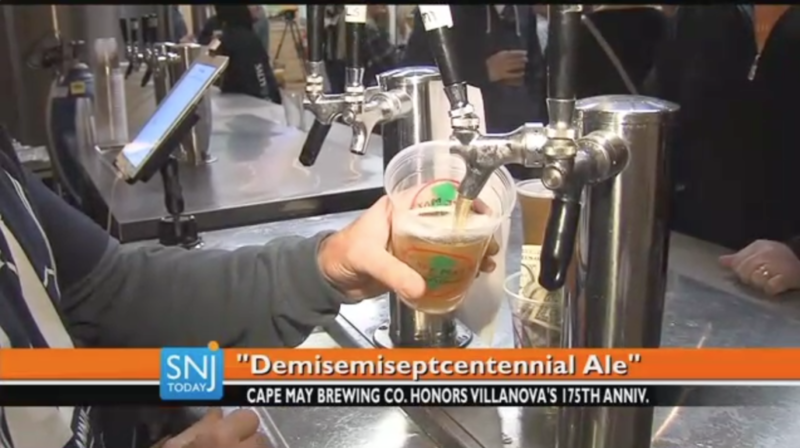 We’ve been getting a lot of love from some major press outlets about our Demisemiseptcentennial Ale. For those of you outside the Philly area, you may not be aware of how much love there is for ‘Nova around here. It’s a Philly institution — it’s been an academic powerhouse for, well…, 175 years, and one of the strongest basketball programs in the area. Philly fans are notoriously fickle — we pelted Santa with snowballs, for goodness sake! — and ‘Nova’s NCAA championship is only the second sports championship this city’s seen since their last one in ‘85. And with a “nearly unpronounceable,” 22-letter name, the press has gone slightly bonkers over this brew. Just wait ‘till they taste it. In the meantime, whet your whistle with these stories. SNJ Today was on-hand at the Szcz the Day Pint Night on January 25th, filming a special segment for the news that evening. 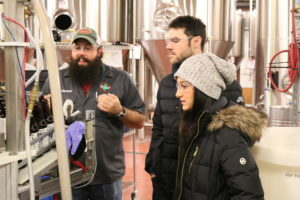 Gary Monterosso, host of What’s On Tap stopped by to film an as-yet-unaired segment of his show on location at the brewery. Check out the video! We’re loving all the attention Demisemi has been getting — as much for us as for Ryan and Hank’s beloved alma mater. ‘Nova is all the rage these days — particularly with the basketball team rolling over nearly every opponent. We’re thrilled to be a part of it, and even more elated to have you along for the ride. For more information on where to find Demisemiseptcentennial Ale, check here! That’s the question on everyone’s lips these days. So, we’ve compiled everything CMBC fans and ‘Nova Nation needs to know about how to get some Demisemi on your lips. 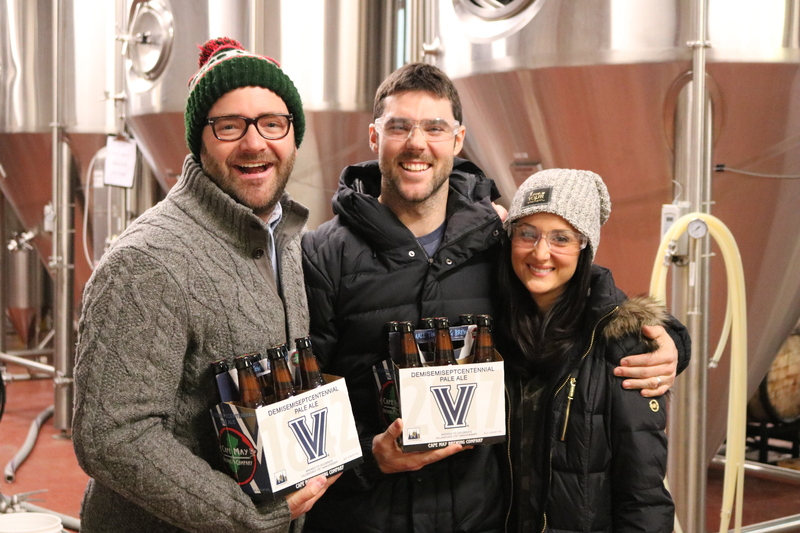 Villanova received their first shipment of this celebrated brew at the beginning of the year, and have already been serving it at events. You can get some in the Donor Lounge at The Pavilion during home games. They’ll also be serving Demisemi at the Student Gala celebrating the school’s 175th anniversary. VU students only, sorry! In addition, you can find Demisemi at next month’s Theology on Tap on the 21st, hosted by President Fr. Peter Donohue, in the President’s Lounge in Connelly Center. As of Monday, Kelly’s Taproom in Bryn Mawr was pouring Demisemi. Kelly’s is up the street from Villanova, has been around since the 60s, and, in some way or another, each student who goes through Villanova ends up there at least once during their college careers. They tapped their first keg of Demisemi on Monday, while the ‘Cats forced the Seton Hall Pirates to walk the plank. It’s possible that it’s still on tap there, but you may want to give them a call: (610) 520-9344. The best way to keep informed of what’s going on in Philadelphia is the Philly Tap Finder. At press time, Demisemi hasn’t been updated there, but you can check back. Or, when in doubt, give a call to your favorite watering hole! We’re releasing Demisemi on tap at the Tasting Room and in bottles in the Brewtique at noon on the 25th: 6-packs will be $12, and cases $42. At the moment, there is a ONE CASE PER PERSON, PER DAY limit on bottles, so bring a friend! We anticipate lifting this limit in the very near future, but with demand being as high as it is, we want to make sure everyone gets a taste. Coincidentally, that’s our Pint Night to support the Andy Talley Bone Marrow Foundation. Villanova grad, Cubs outfielder, and general, all-around great guy Matt Szczur will be in attendance from 5-8pm, helping us to raise money and awareness for a cause that’s close to his heart. It’s our first sponsorship of the year, and we couldn’t have picked a better event. Matt Szczur is hosting this event at Cape May Convention Hall, benefitting the Andy Talley Foundation. This exclusive dinner has been sold out for weeks, so we hope you already got your tickets! For more information, see here. We’re distributing to our wholesale accounts later in the week. If your favorite bottle shop stocks CMBC brews, Demisemi should be rolling in there by the end of January or the beginning of February. The Cloverleaf has 28 taps, and we’re taking over ALL OF THEM. This is the farthest north we go (and it’s once a year! ), so all northern ‘Nova fans should probably put this one on their calendars. Typically, the Cloverleaf will do growler fills for events such as this either late in the evening or the next day, so you may be able to get your growler filled. The good news is that this brew will be available all year long. We know you’re dying to get a taste right now, but you’ve got another eleven-and-a-half months to get your hands on a bottle. We promise, it’s not going away anytime soon. Bear in mind that, for tap accounts, we only know venues to which Demisemi has been sold. We simply don’t have a mechanism for keeping track of when the brew is tapped. Check with the bar or restaurant to see if it’s pouring yet. Give them a call or check their social media and websites. Regardless, we’ll be keeping you updated all year — at Straight to the Pint, on our Facebook page, and through Twitter and Instagram. 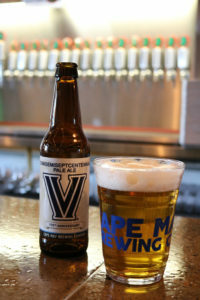 In addition, we’ve got a dedicated page on our website at capemaybrewery.com/villanova. Check back! On January 25th, CMBC will be hosting our first Pint Night of the year. We’ve got a great night planned, all to support the Andy Talley Bone Marrow Foundation — an organization founded by Villanova’s former football coach to raise funds, awareness, and donors for bone marrow donation. Every three minutes, someone in the United States is diagnosed with blood cancer. Affecting over 1.2 million Americans, leukemia, lymphoma, and myeloma account for approximately 10% of cancer diagnoses each year. 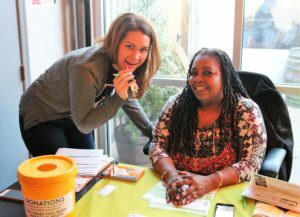 For many of those diagnosed with the disease, their one hope for survival is a bone marrow transplant. Bone marrow is the body’s blood-producing engine, and, if it’s producing faulty cells, a transplant will, in many cases, fix the problem. Cubs outfielder and Cape May native Matt Szczur got involved with the Andy Talley Foundation while at Villanova University. 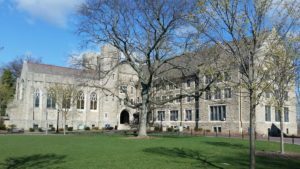 The Foundation enlists college football teams to host donor drives on their campuses, and Matt participated in Villanova’s drive. Matt proved to be a match for a young girl in the Ukraine named Anastasia. He ended up missing 10 games of the Villanova football season to participate in the donation, just weeks before the Major League Baseball draft. Since then, Matt and his wife Natalie have dedicated part of the offseason to the Foundation, raising awareness and funds for marrow donation. 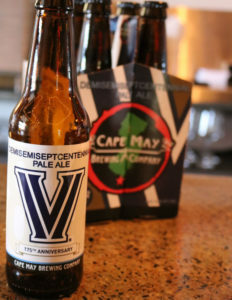 For the second year, Matt is hosting the Szcz the Day Dinner on January 27th at the Cape May Convention Hall to raise funds for the Andy Talley Bone Marrow Foundation, and Cape May Brewing Company has signed on as the official beer sponsor, with Villanova’s Demisemiseptcentennial Ale served in bottles and on tap. Matt’s thrilled to have us be a part of it, as well. He and wife Natalie helped us come up with the evening’s one-off: Szcz the One-Off Wednes-Day, Demisemi infused with coconut, pineapple, and orange. We’ll be helping Matt kick off his Szcz the Day Dinner at the Pint Night. Starting at 5pm, $1 from each pint sold will be donated to the Andy Talley Foundation. We’ll be releasing Demisemiseptcentennial Ale in bottles and on tap at the Pint Night, as well. 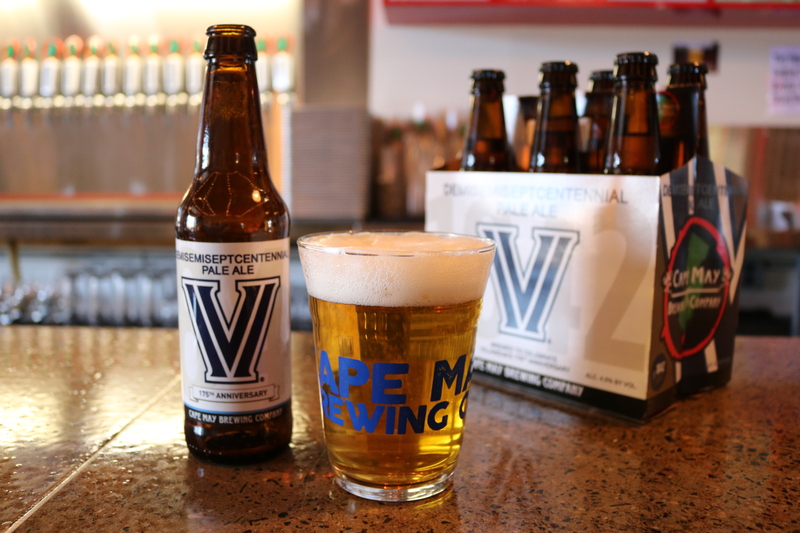 Brewed to mark Villanova’s 175th anniversary, Demisemi has a generous helping of Centennial hops to round out the flavor profile with German Pilsner malts on the grain bill. The result is a classic Pale Ale, easy-drinking and approachable, light both in color and in ABV. Matt will be on hand at the Pint Night with representatives of the Foundation to help raise money and awareness. 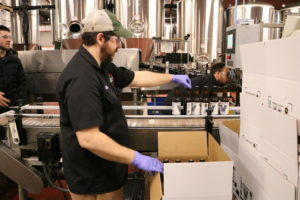 There’ll be donation boxes scattered throughout the brewery, and the Foundation’s staff will be available to answer questions about the Foundation and blood cancers. 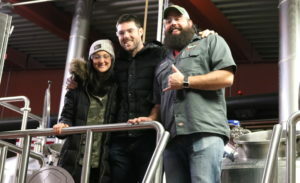 Stop down to the brewery on January 25th from 5 to 8pm — meet Matt Szczur, taste Demisemiseptcentennial Ale, and help raise money for a great cause.